So you're going to Oktoberfest. Maybe it's not even an official Oktoberfest event, but it's a fest of some kind, you know there's going to be beer, and everything is vaguely German. 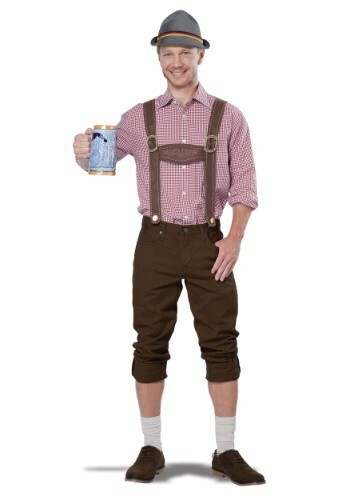 The only question that we want to know the answer to is: are you going in the appropriate Bavarian wear, or not? Because, if we know our beer fests (and trust us, we've been to our fair share) there will be a ridiculous number of average Joes around. You know the kind. Baggy shorts, graphic t-shirts, sports sunglasses and baseball hats? The boring guys you see at any and all fairs and events? Interested in the beer but not invested in the festival? Don't be one of those guys. Why? Because they're boring. Don't you want to be more than boring? Wouldn't you rather be noticeable at least? Now, we're not asking you to go out and buy a brand new pair of leather Lederhosen, a vest, or Bavarian shoes. You can start small, say our Men's Lederhosen kit. This kit has a brown pair of embroidered suspenders that clip on to your own shorts or pants to get that Lederhosen look. The kit also comes with a felt had with band in German colors. Pair it with your own comfy pair of shorts, shoes, and a button-up, and you won't have to worry about being another boring Joe. Now, lift that stein with pride! Prost! I was a bit disappointed with this 'kit'. It is, undoubetdly, a Lederhosen kit, but I was not happy with the flimsy material used to make this. Also, the "straps" are far to wide for the buckle, are very puckered, and turn 'backwards' too easily. Thankfully, I only needed this outfit for a 'fun' get together day and don't need a more 'realistic' looking one. Considering the price, and the fact it was only the suspenders and hat, I am not pleased with the quality. I realize these are not 'custom made' nor custom designs, but they should at least be much more suspender-like than they are and of sturdier fabric.